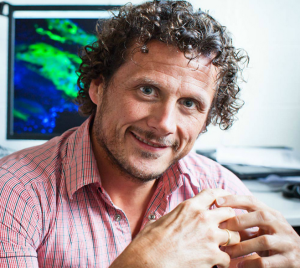 Veronica Rezelj, Ph.D. student in the Elliott lab, interviewed Paul Duprex (@10queues) when he visited us at the MRC-University of Glasgow Centre for Virus Research. Paul is a Professor of Microbiology at the National Emerging Infectious Diseases Laboratory (NEIDL) in Boston University. His research involves understanding the molecular basis of pathogenesis and attenuation of respiratory paramyxoviruses, with the aim of developing rationally attenuated vaccines for these viruses. This post is the fourth in a series of ‘meet the expert’ articles about worldwide investigators working in virology research. These posts are written by the CVR bloggers and are designed to educate, engage with, and inform the public and fellow scientists about who scientists are and what are our motivations. What are your research interests and what sort of things do you do in your lab? Our interests are respiratory paramyxoviruses. I’m based at the National Emerging Infectious Diseases Laboratory (NEIDL) in Boston, where we have labs of Containment Level 2 (CL-2), -3 and soon -4, which allows us to work with all sorts of pathogens. But the ones that I work with at the moment are BSL-2 pathogens. We are interested in pathogenesis with real natural isolates of the virus coming from human patients, companion animals, or wild-life patients, and we try to understand how that virus gets in, about, out and from one animal to the next. To do this we can use animal models of disease, which are really important to understand disease in the context of a functioning immune system, and an animal which is doing its normal things. We work with viruses that cause profound, systemic infections and give you lifelong immunity (measles and mumps), for which we have vaccines. But we also work with viruses such as human Respiratory Syncytial Virus (RSV), for which there is no vaccine, and you get an infection one year with one type, and then the next year you get the infection with the next type, and we don’t get lifelong immunity and we don’t have a vaccine either. To me it’s really interesting to ask that question. Why has it been so hard to make a vaccine? I think studying viruses for which we have great vaccines, such as measles and mumps, would help us understand how to rationally design vaccines from maybe synthetic viruses. We also do a lot of reverse genetics, which simply means stitching together molecular clones from clinical isolates, making the viruses, and growing them in cells which are relevant to the disease. So if the virus infects immune cells in the animal, or the person, then we grow them in immune cells before we put them back into the animal, so that we’re able to copy as much as we can what happens in nature. The viruses we work with are products of the cells in which they get grown. For example, if the virus has an envelope, the envelope came from the cell. So a virus grown in an immune cell might be really different to a virus grown in an epithelial cell, for example. Concerning the recent measles outbreak in the US, some reports in the media where quite shocking to me. In one of them from CBS news, for example, a medical doctor claimed: “although it’s contagious (measles) they’re not getting meningitis, the plague or Ebola”. He also said: “Individual parents making that decision (of not vaccinating their children) are not the ones bringing back measles,” “Measles isn’t coming back. We have 70 cases of measles right now and we have 30 million Californians.” How would you, as a scientist who is interested in the pathogenesis of this virus, reply to this? It is an unusual opinion because there’s a number of problems with that argument. There are risks associated with everything that we do, there’s a risk associated with me deciding to come and give the seminar today at the CVR because I increased my likelihood of dying on a plane. And actually that wasn’t the biggest risk. The biggest risk was probably getting into the car to drive from the airport to the building. So people make risk judgements all the time. What people don’t remember, is that measles is for the most part, and most people, a disease which causes quite severe symptoms such as rash, photophobia and there’s secondary infections you can get. But for the most part, the virus is eliminated by a really functional immune system, the patient recovers and we get this really lovely lifelong immunity. But 1 out of 1000 people can get encephalitis, and those people will die from that disease. Now, 1 in 1000 is much more likely than a plane crash, or a car crash, or falling down the stairs. So you see the risks there? Vaccination is not zero-risk. But it’s much more risky to get measles (the disease) than it is to get the vaccine. This is what is really hard for people to understand. The doctor is right in saying there might have been 70 cases in California, but then it spread to different States and fortunately we don’t have anyone dead. But let’s think about this problem outside the US. There was also a measles outbreak in Berlin and there was one person dead because of the virus, and the person was not vaccinated. Some people won’t vaccinate because they believe they’re injecting poison (you’re not), you’re injecting mercury (you’re not), you’re injecting a virus that causes autism (you’re not), you’re injecting a virus that causes Crohn’s Disease (you’re not). But it’s really difficult for the general public if a doctor is so authoritative. Who should people believe if they have no connections to a trained virologist or a specialist? I feel really sorry for parents, and I think that someone who says something can really abuse those parents’ trust in the medical establishment. And the medical establishment, the pharmaceutical industry, the governments and general people really do see the benefits of vaccination. There’s so many people alive because of vaccines today than probably any other therapeutic intervention. And the final reason why I think that person is completely wrong is that there is an incredibly selfish element to it. There are some small children who cannot be vaccinated. Why? Because they might have an immune deficiency and the vaccine is too risky, much more risky than an infinitesimal risk. Another reason is that they might have an inherited genetic immunodeficiency or they might be immunosuppressed. What’s the best way to protect that person? Well, the concept is called herd immunity. I mentioned in my talk that we need to vaccinate 95% of the population to stop transmission. So vaccination is not just self-interest, it is a social contract, and in any society that is developed, we can’t just look after ourselves, we have to think about the broader society. So if you choose not to vaccinate your child and everybody else in the world chooses to vaccinate their child, that is the safest thing that can happen, because you don’t take the vaccine, but everybody else vaccinates, so there’s no chance of your precious little child getting the disease. It’s like Charlie and the Chocolate Factory, where only one person gets the lucky ticket—that’s purely selfish. So by vaccinating our child, we are also protecting people who cannot be vaccinated. Of course people should have freedom to choose, but we’re not islands. Can I choose to drive down the wrong side of the road? No, because the social contract says we’re all going to drive down this side of the road. If someone decides to do the opposite, it’s totally irresponsible. So that’s why I believe that person is 100% wrong. I can’t avoid asking a question about the gain-of-function debate. Some of us think so-called gain of function experiments, or as you call them aTRIP, are crucial because they can give us direct insight into cause and effect relationships. Of course we need to act as responsible scientists, assess the risks and perform research as safely as we can. Why do you think these experiments are important in virology? Do you think they are helping us to move forward? Experiments that are being called “gain-of-function” are really experiments that every single person who does virology will conduct. These types of experiments are the bedrock of virology. Anyone who really understands what virology is, realises that whenever you take something out of the natural host, you change it. If you say for whatever reason that you think these experiments shouldn’t be done for influenza (see our post on this topic), what are you saying? Are you saying that you don’t believe that it’s worthwhile understanding transmission? I disagree. Are you saying that you don’t believe that biocontainment works? I disagree. Are you saying that you don’t believe that it’s possible to vaccinate, have drugs or very rigid standard operating procedures for people doing those experiments? Yes it is! But just back to what we were talking about, nothing that we do—biking, driving, walking to work—is without risk. So we have to be responsible scientists and make sure that we mitigate and reduce the risk in every way possible so that the scientist (or the people who they might come in contact with) are not exposed to something that they shouldn’t be exposed to. So we absolutely have to be responsible and have good procedures, but we also have to not look to the apocalypse happening. So we can’t say it’s an experiment it’s just not worth doing simply because it’s too dangerous and this and that scenarios could happen. Where’s the evidence for that happening? Adaptation—how does a virus evolve and what determines its adaptation? How does it alter? What phenotype is gain and which one lost? Transmission—how is a virus transmitted within or between species? Resistance—how does drug resistance develop? Infectivity/Immunogenicity—why is this virus more infectious than the other? How can a virus interact with the immune system? Pathogenicity—why can a virus cause disease while the other one can’t? I want to understand and answer all of those aTRIP questions. And I am sure if we ask colleagues in the CVR right now, they want to as well. And we are all doing experiments to understand this, either in CL-2 or CL-3, under appropriate containment, depending on the virus. There are big experiments going on in the field where there are encounters between animals, viruses and people. And if you look at Ebola – what is the reservoir? Why is it spreading? What’s happening? We need to understand all this. Because when ebola came along people started speculating that it was going to go airborne. What was the evidence that it was going to go airborne? People come up with these theories and scare others to death. And this is what happened with the gain of function debate, and the result was a moratorium for people doing these sort of experiments on flu, SARS and MERS (which has now been changed). As a consequence the work of postdocs and PhD students starts and stops and starts and stops continuously, which is really bad for those trainees. It is also really bad for people working on universal flu vaccines. Who do you believe is going to make the universal flu vaccine? Is it going to be people who are opposed or want studies about transmission and infectivity stopped? Or is it going to be a highly functional flu community? I trust our colleagues. Some of the people in the flu community have been painted as arrogant and irresponsible and they are not, there’s none of my colleagues weaponizing anything. Recently we had a debate at SGM where the weaponizing of viruses as a result of gain of function experiments was brought up. But that’s not relevant. We are not making bioweapons, we are doing virology, and this is why I am passionate about it, because it can have implications not only in virology, but also in all microbiology. I think there’s other things we should we worrying about. What do you think you would have been if you hadn’t become a scientist? Me?! What job? I certainly wouldn’t have been a footballer…or a rugby player… or an artist…or a musician…I can tell you all the things that I wouldn’t have been. I would have been a really bad accountant and a horrible doctor. I would have been bad at pretty much everything else. But science is about teaching, right? So I would have been a good teacher because I enjoy communicating what I like. But I have to say that I get paid to do my hobby. So I don’t really think I work, anyway. And it’s a hard hobby, because we work hard. But I am very grateful that I can be paid to do my hobby knowing how hard it is for many people. Sometimes we (scientists) complain a lot, we hear a lot of “funding is hard” or “I can’t get this paper published” or “this experiment doesn’t work”, but you know what? We are really lucky people and I am very grateful for what we get to do. The paramyxoviruses are a diverse group of enveloped, negative-sense single-stranded RNA viruses that are the causative agent of a number human and animal diseases, such as: canine distemper, rinderpest, nipah and hendra and Newcastle’s disease. These viruses can infect a wide range of vertebrates, such as fish, reptiles, birds, mammals and humans. Measles is probably the most recognized in the family at the moment, as despite having an effective vaccine, outbreaks continue to occur. This highly contagious Morbillivirus can cause rash, fever, photophobia and in some cases, death. You can read more about measles in our previous post here, or watch this video. Other recognized viruses include respiratory syncytial virus, which is the major cause of pneumonia and bronchiolitis in young children, and mumps, which causes a systemic febrile infection in children and young adults and can cause meningitis. Viruses such as Hendra virus and Nipah virus, which have been isolated from humans, bats, horses and pigs, can even cause viral hemorragic fevers. 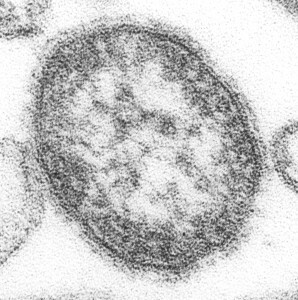 The MRC – University of Glasgow Centre for Virus Research undertakes research focusing on the structural biology of respiratory syncytial virus, parainfluenza virus and measles virus – led by David Bhella and Frazer Rixon. There is still a moratorium on the funding of GoF, and only from China new studies appear that use it. Early next year we will hear more from both the European Union and the NSABB (with help of Gryphon Scientific) under what conditions GoF biotech with pathogens can continue. Today I came across an earlier TWiV session where Ron Fouchier explained what his plans were at the time. He had just created an airborne transmissable form of the H5N1 virus, which was lethal for ferrets when injected down the trachea (all died), but which only caused severe flu via the nose (ferrets in the upper respiratory tract group lived). His answer to what kind of research he wanted to do after the previous moratorium comes in the video after 37 minutes. – “Map the minimal determinants of transmission (almost finished)”, I suppose that was the 5 mutations of Fouchier & Kawaoka necessary for H5N1 to become airborne contageous. In the video Fouchier also urges to do more dual use research (dual use = medical & military), not less, he sees that as the way ahead. I think this illustrates the point I made earlier that having all that knowledge on the scientific plate doesn’t make our world a safer place. One day we hear the news that we can have a universal flu vaccine where the immune system targets the uniform stem of the influenza virus instead of the group’s multiform head. Next day Kawaoka has already mutated the stem so the flu virus becomes extra virulent which can help speed up vaccine production in mammalian cells. I wonder, suppose we find a universal way to protect ourselves against all types of flu. Natural immunity will be a thing of the past, people will become very vulnerable to deliberate “dual use” mutations. This knowledge won’t go away, biotech instruments like CRISPR are here to stay. How can we avoid a biogarage terrorist à la Anders Breivik or a depressed lab worker à la Andreas Lubitz downing the plane? There’s not that much ideological difference between the polical murderer Volkert van der Graaf and the animal virologist Thijs Kuiken, who both care very much for the animal life on our planet that’s subject to a ecological disaster brought on by humanity. Then the only consequence can be that biotech is delivering human society over to the surveillance state. But once we have our very own secret state, the age old practice of war between “our people” and the rest of the world comes into play. No scientist has ever resisted a general who simply demands better weapons. A dictator may take over a modern democracy by spreading xenofobia, when it can happen in the Netherlands it can happen to you. I only dare whisper it to the wall, where hardly anyone listens. My fear of what if. There is still a moratorium on the funding of GoF, and only from China new studies appear that use it. Early next year we will hear more from both the European Union and the NSABB (risk assessment by Gryphon Scientific) under what conditions GoF biotech with pathogens can continue. Today I came across an earlier TWiV session where Ron Fouchier explained what his plans were at the time. He had just created an airborne transmissible form of the H5N1 virus, which was lethal for ferrets when injected down the trachea (all died), but which only caused severe flu via the nose (ferrets in the upper respiratory tract group lived). His answer to what kind of research he wanted to do after the previous moratorium comes in the video after 37 minutes. – “Map the minimal determinants of transmission (almost finished)”, I suppose that was the 5 mutations of Fouchier & Kawaoka necessary for H5N1 to become airborne contagious. I wonder, suppose we find a universal way to protect ourselves against all types of flu. Natural immunity will be a thing of the past, people will become very vulnerable to deliberate “dual use” mutations. This knowledge won’t go away, instruments like CRISPR are here to stay. How can we avoid a biotech garage terrorist à la Anders Breivik or a depressed lab worker à la Andreas Lubitz downing the plane? There’s not that much ideological difference between the political murderer Volkert van der Graaf and the virologist Paul Duprex, who both care very much for the animal life on our planet that’s subject to an ongoing ecological disaster brought on by… too many humans.